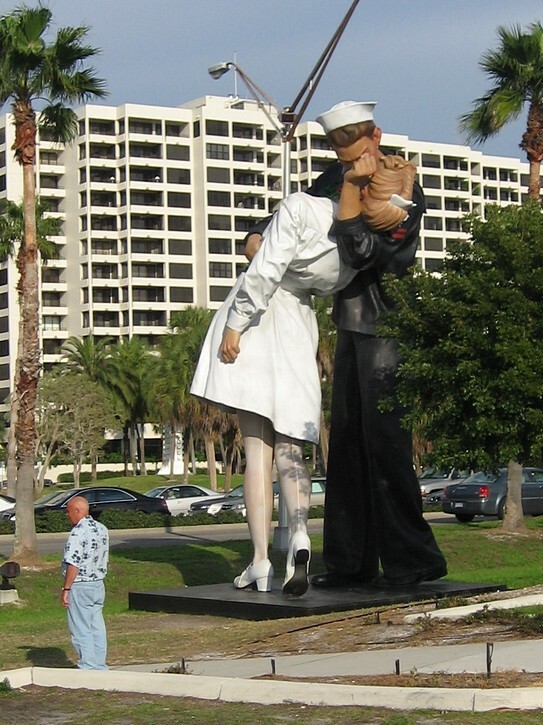 This is a fairly long ride that will bring you through Sarasota’s downtown waterfront, Lido Key and its trendy St. Armands Circle, a long stretch of unobstructed road on Longboat Key, and Anna Maria Island, where it is still possible to get a sense of what ‘Old Florida’ might have been like. 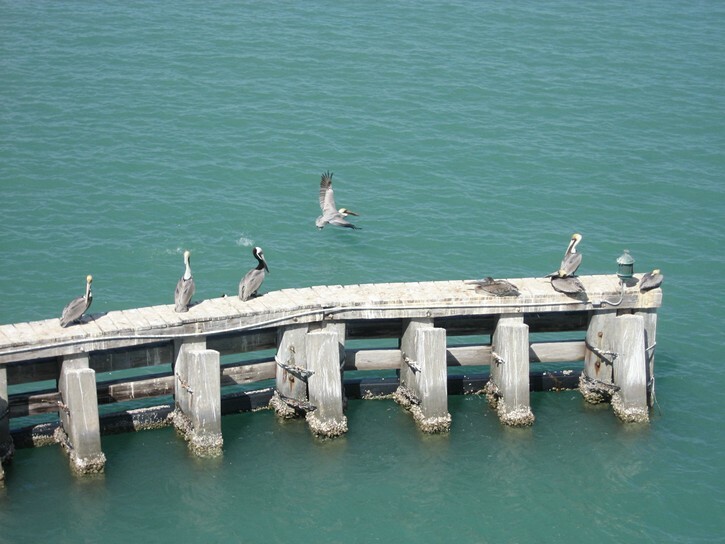 One of the best things about this ride is that you’ll never be very far from the Gulf of Mexico shoreline, and in many areas you’ll get a direct view of its open waters. Another plus is that each phase of the ride, or each island along the route, seems to have its own peculiarities and unique character. 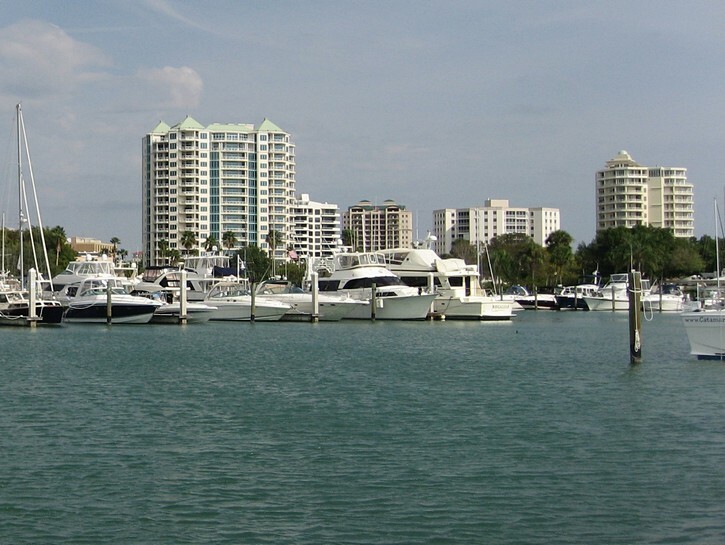 The Sarasota waterfront has a big-city feel about it, Lido Key gives the impression of being chic and artsy, Longboat Key has an air of being affluent and reserved, while Anna Maria Island appears to be more down to earth with a regular middle class flavour to it. Almost all of this ride takes place on roads with paved shoulders, multi-use recreational paths, or quiet residential streets, although there are brief areas where you have to share the road with a bit of traffic. There are many places along this route where you’ll be able to buy a snack and something cold to drink, or stop at a restaurant for a meal. Needless to say, it is very flat, with the exception of one long bridge/causeway that you’ll have to climb to get to Lido Key. As described in this article, the ride is a little over 27 miles in one direction, or about 55 miles (89 km) with the return trip. This may be getting a little long for some people, but you could easily reduce this distance by bringing your bike by car for part of the way. 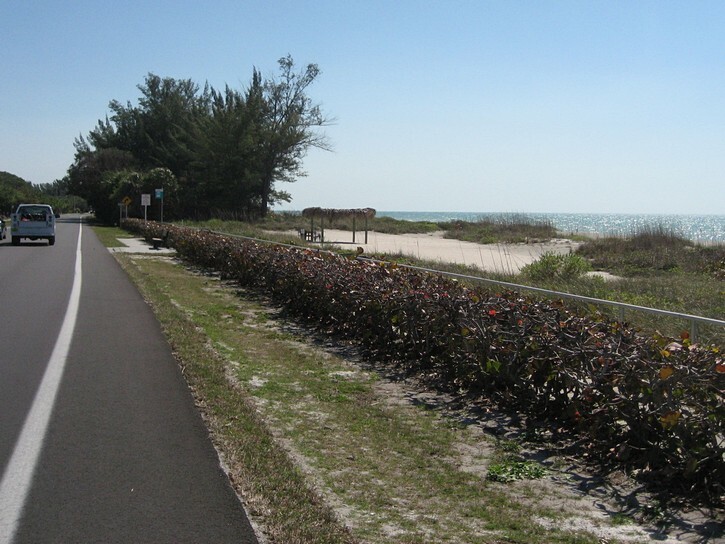 For example, it should be possible to keep the entire ride to about 35 miles (56 km) in length by starting in Lido Key, and not cycling all the way to the northern tip of Anna Maria Island. 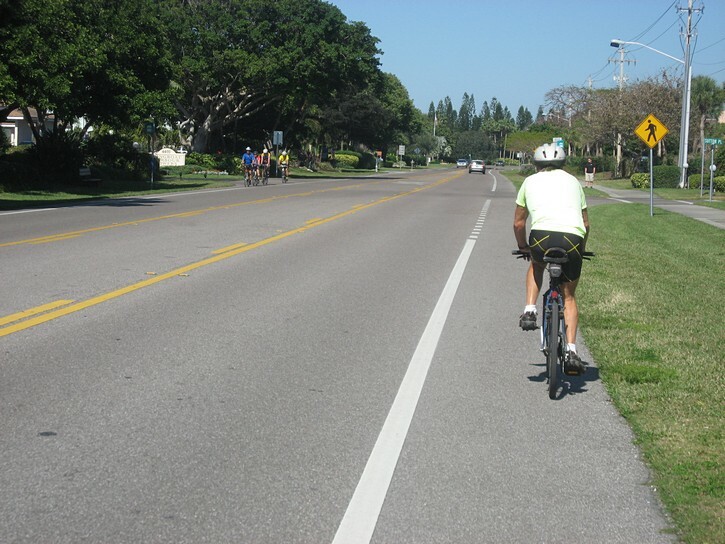 For the purpose of this article, the ride begins in Siesta Key. 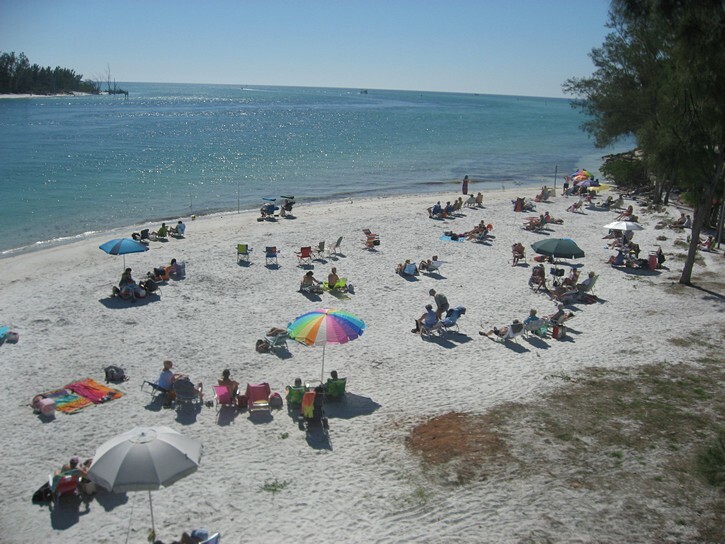 There is no particular reason for this other than Siesta Key is were the author stays during his winter getaways, and that it is a vacation spot that is centrally located for various regional rides. 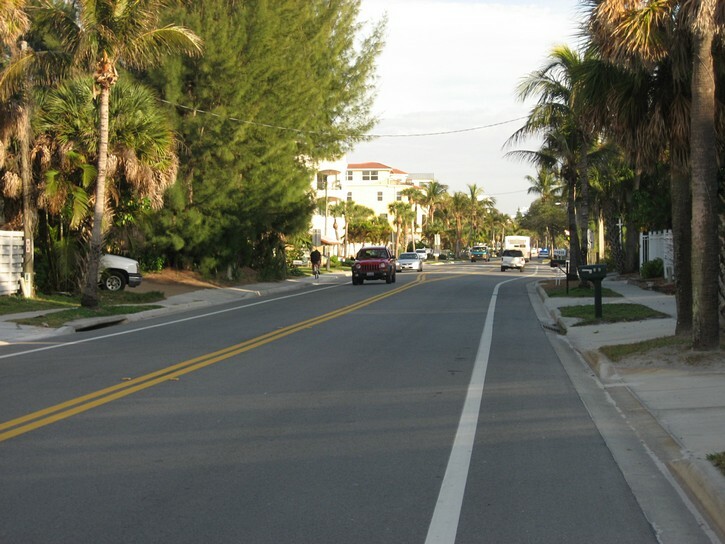 You start by cycling along Higel Avenue to the north end of Siesta Key. It automatically becomes Siesta Drive, and takes you over a bridge to the mainland. Except for a few dozen feet, there is a good paved shoulder on both these roads. Four or five blocks after crossing the bridge you come to the intersection of Siesta Drive and Osprey Avenue. You should now turn left and head north on Osprey. But before doing so, you might want to take a little detour to the right and go south a short distance on Osprey. 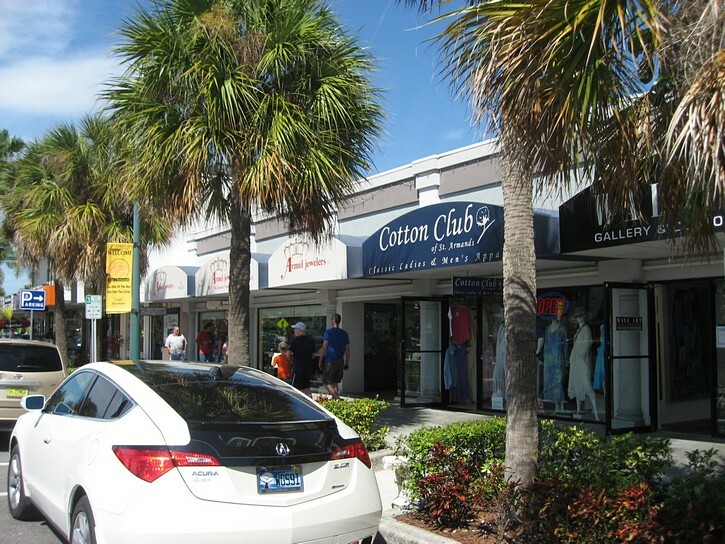 Here you will find two reasonably large bike shops (Sarasota Cycle & Village Bikes) that are almost next door to one another. You may want to check them out if your are in need of any parts, accessories, or service, or if you just want to see what’s happening with the local cycling community. Whatever the case, you’ll continue your ride by going north on Osprey Avenue. It has a paved shoulder, but it is a fairly busy street, so you don’t want to stay on it longer than necessary. After pedaling about 8 or 9 blocks, look for McClellan Parkway, which intersects the west side of Osprey at a 45 degree angle. Turn left onto this quiet street. McClellan soon becomes Orange Avenue will lead you to a major intersection with Mound Street (an extremely busy 6 lane road that’s really part of the Tamiami Trail Highway). At this point, the multi-use recreational path is one short block to your left. In theory, you would get to it by crossing to the north side Mound Street, riding one block along this busy thoroughfare, then crossing back to the beginning of the pathway. In reality, it is easier to simply walk your bike for one block on the sidewalk on the south side of Mound Street. 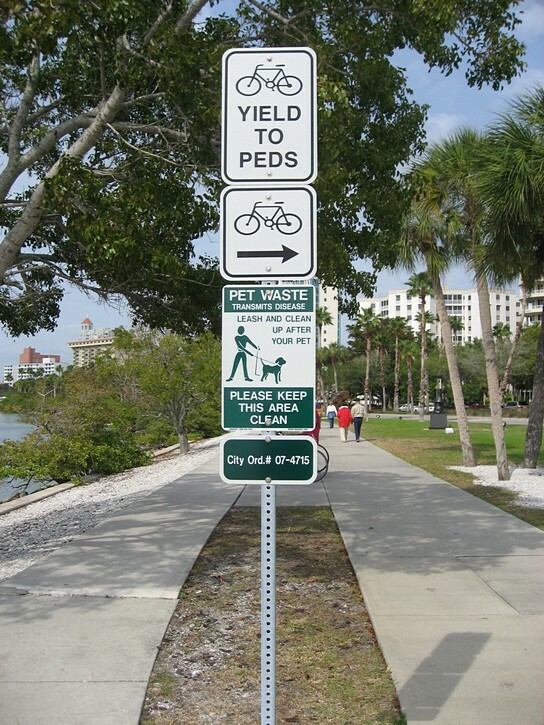 Instead of going directly to the multi-use recreational path, you have the option of heading into downtown Sarasota. To do so, cross Mound street and continue cycling north on Orange Avenue (which has a good bike lane). In 9 or 10 blocks you will come to Main Street. 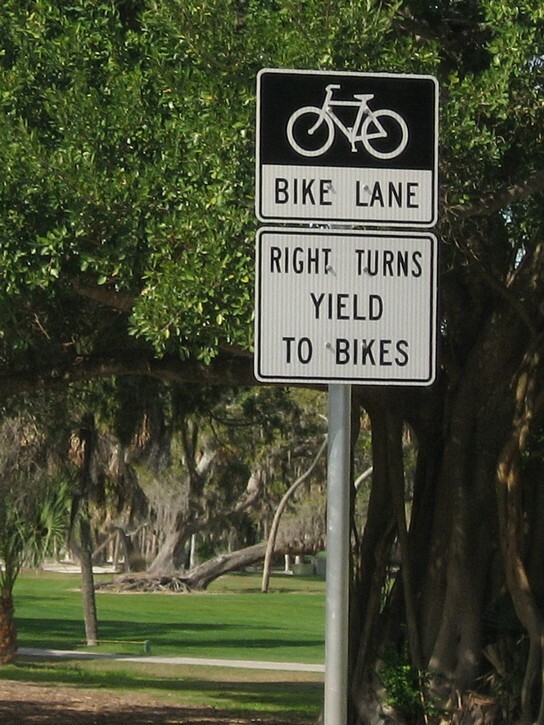 Turn left onto it and you’ll be riding through the heart of downtown Sarasota. This tree lined street has a speed limit of 15 mph, and it is full of restaurants, bars, boutiques, and other small stores. 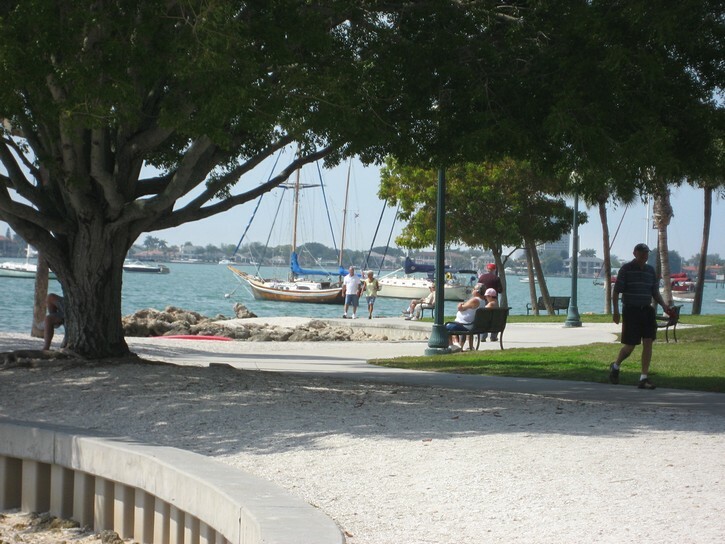 If you follow it all the way west (through the traffic circle), it will bring you to Sarasota’s waterfront. 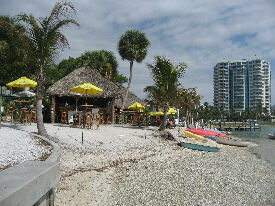 Sarasota bayfront restaurant and tiki bar. Although the detour through the downtown area may be interesting, heading directly to the multi-use recreational path on the waterfront makes for a more relaxing ride. Here you’ll be cycling on a narrow strip of park land between the shoreline on the left, and a major six lane road on the right. There is a large sailboat anchorage area on the water, and you’ll soon see a small peninsula on which there is a restaurant and outdoor tiki bar . 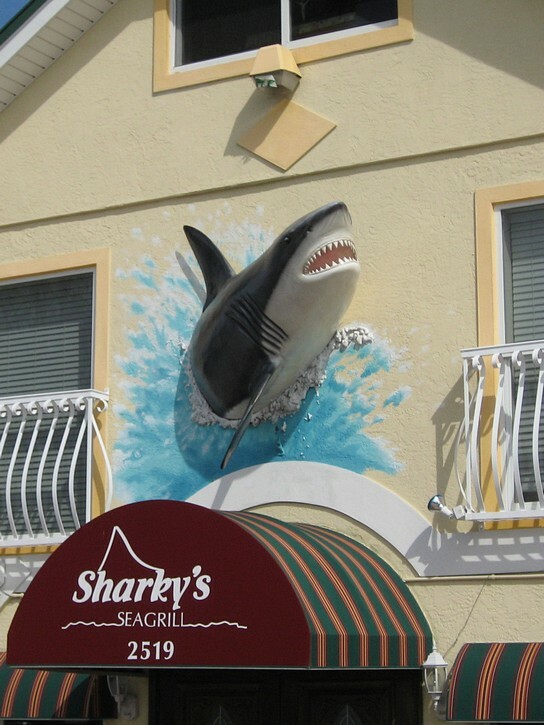 There are public restrooms behind this restaurant. 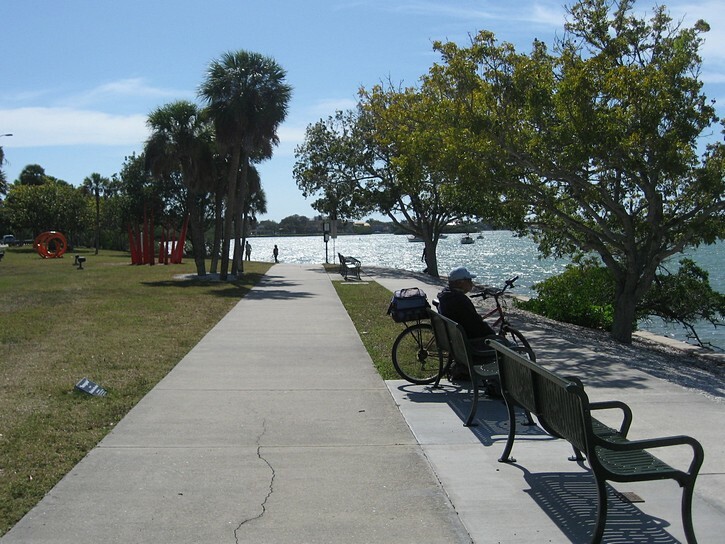 As you approach the north end of the pathway, it runs right next to Gulfstream Avenue (another busy road), and it will automatically bring you to the bridge and causeway that leads to Lido Key. The bridge is quite a long one, and since it has no lifting span, it is built high enough to allow sailboats (with their tall masts) to pass underneath. This means you will have to do a bit of hill climbing. On the other hand, your hard work will be rewarded with an effortless burst of speed on the decent. There is, however, one small complication with riding across this bridge. The pathway automatically leads cyclists onto a wide sidewalk on the left side of the bridge, but after a while there is a sign indicating that you have to walk your bicycle. To avoid this predicament, you have to use the eight-foot wide shoulder on the right side of the bridge. 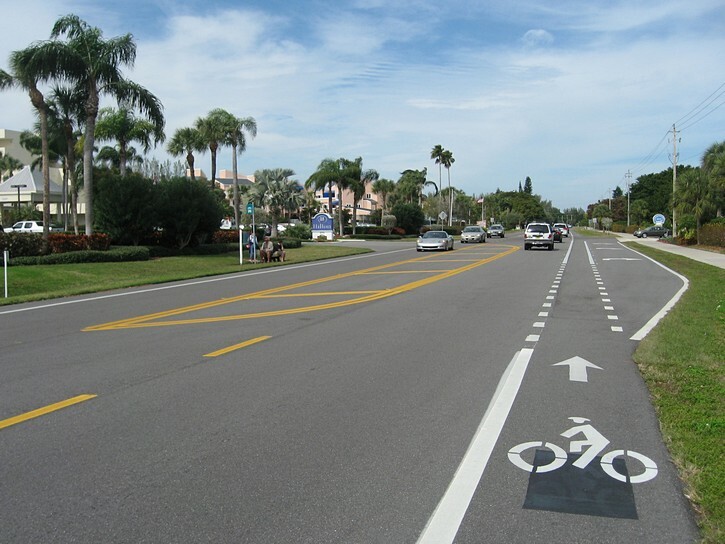 To do this, it is necessary to cross the road at an intersection well before getting on the bridge (it’s best to use the intersection at Gulfstream Avenue and Sunset Drive). 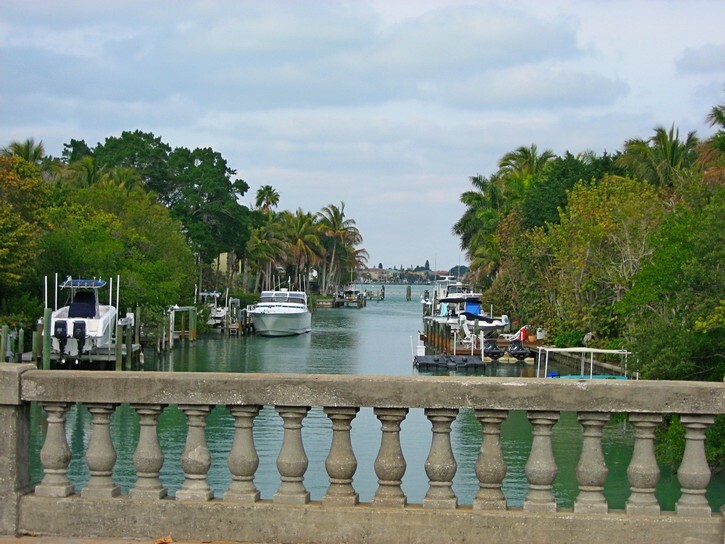 The bridge leads you to a causeway that brings you to Lido Key and St. Armands Circle. The only problem here is that you’ll encounter an older low level bridge that doesn’t have any kind of shoulder for a couple of hundred feet. If you’re uncomfortable riding with traffic in tight quarters, you may have to walk you bike on the sidewalk for this short distance. Note that there is a good paved shoulder everywhere else. You’ll soon come to St. Armands Circle, which is a fairly large traffic circle with a small park in the middle. 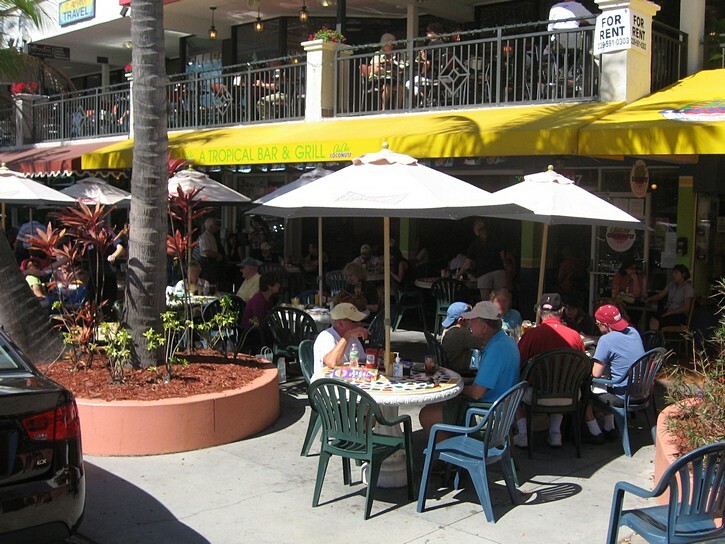 The road around it is over flowing with sidewalk cafes, restaurants, bars, boutiques, art galleries, antique shops, on so on. The area also hosts weekly art and craft shows at certain times of the year. In other words, you’ll probably want to take a look around, at least once. 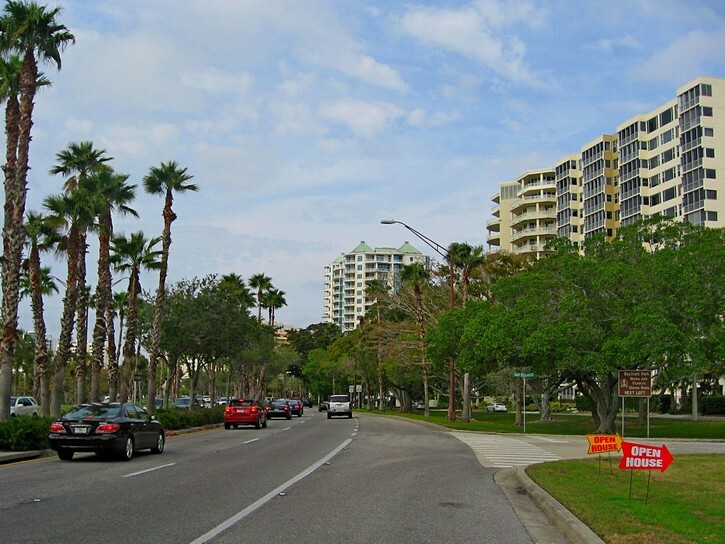 After checking out St. Armands Circle, you will head north (turn left) on Boulevard of the Presidents, which quickly becomes John Ringling Parkway. 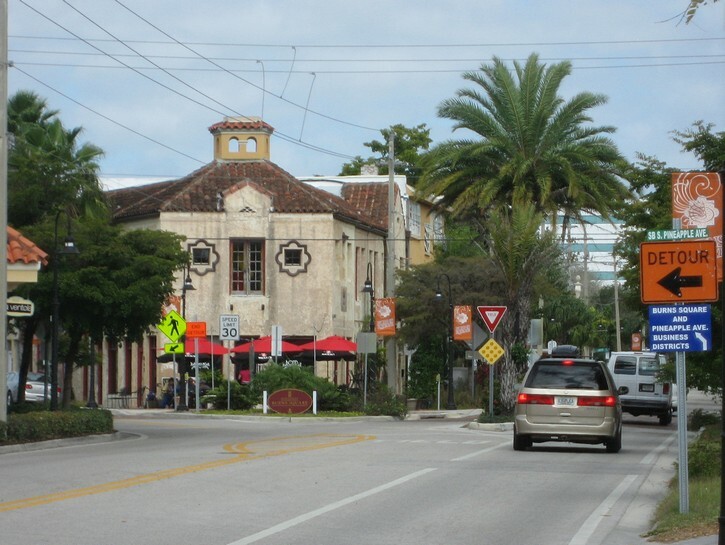 Note that it is possible to bypass all the commotion around St. Armands Circle by turning right onto North Washington Drive (two blocks before the circle). 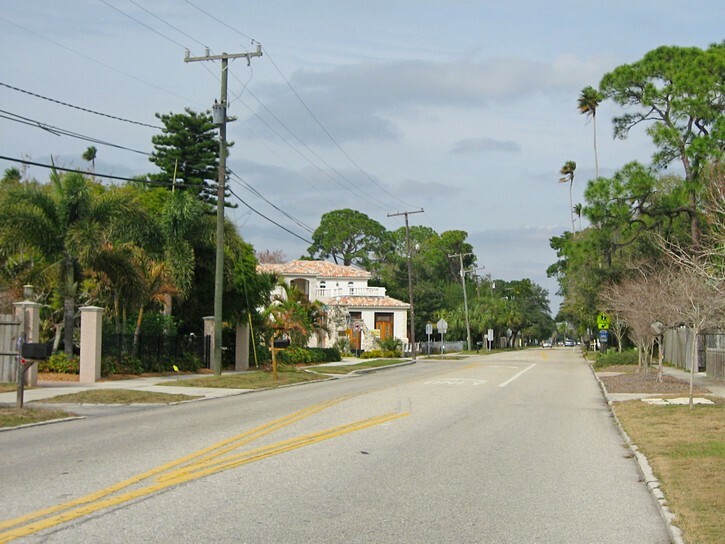 This street connects with John Ringling Parkway a little further to the north. The John Ringling Parkway will bring you to the bridge that crosses over to Longboat Key. 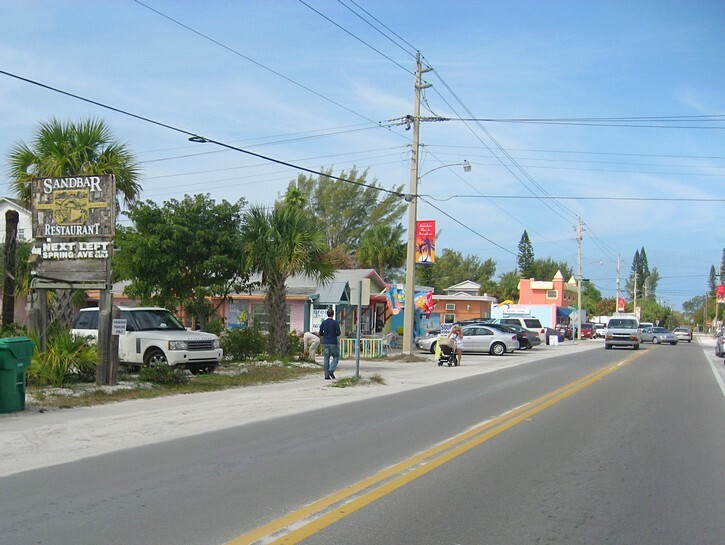 Just before leaving the Lido Key, you will pass by Ken Thompson Parkway on your right, and you will see a Grill and Bait Shop in the northeast corner of this intersection. 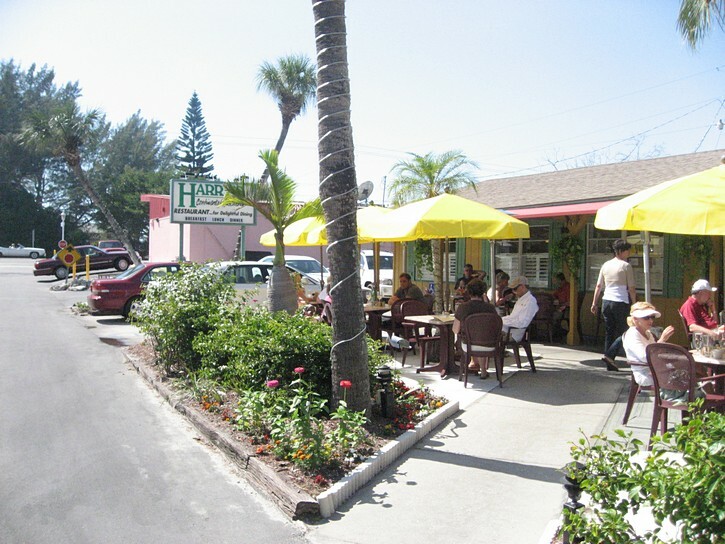 This is worth mentioning because there are some parking spots opposite the Grill and Bait Shop that could be used by people who want to bring their bike by car and start the ride on Lido Key. 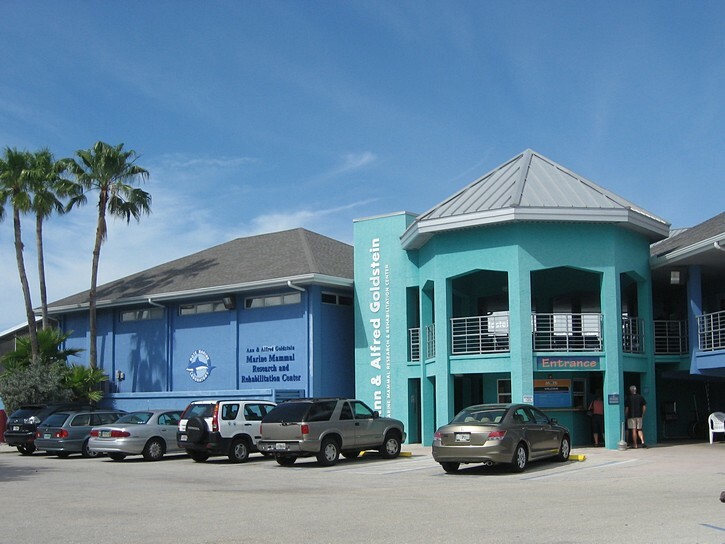 It is also worth pointing out that continuing on Ken Thompson Parkway fora short distance will bring you to Mote Aquarium and Laboratory. A visit to this impressive facility could come in handy if you’re looking for an excuse to take a break from all your cycling. 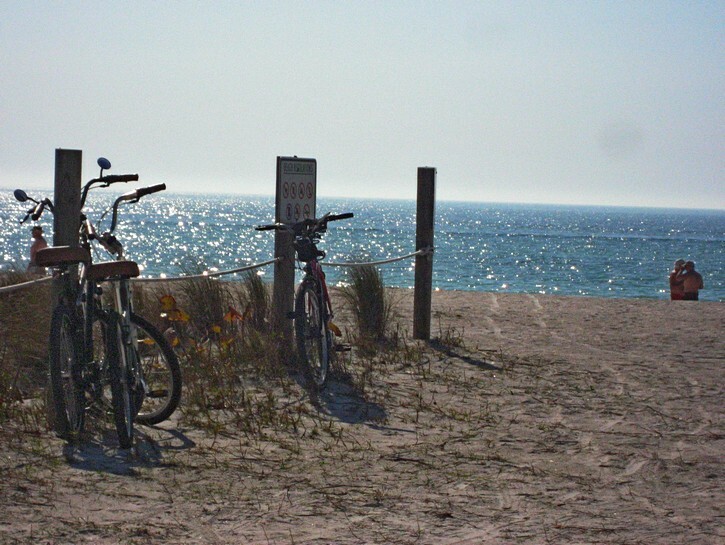 The next leg of your ride involves cycling across Longboat Key. This island is almost 10 miles (16 km) long, and it is quite narrow in a number of places. 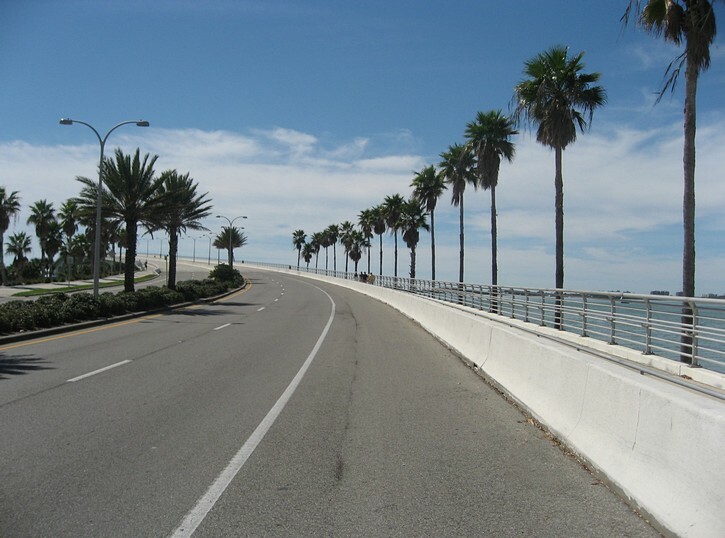 Basically, you ride along Gulf of Mexico Drive (which has an excellent paved shoulder) in a straight line from one end of the island to the other. 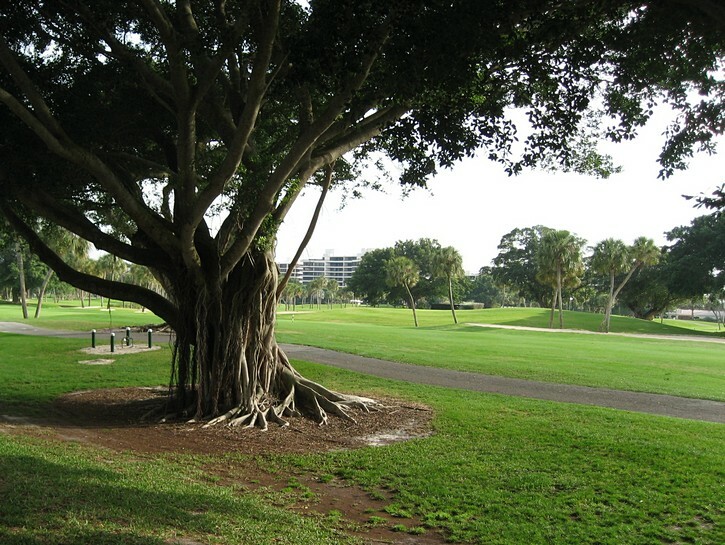 Longboat Key gives the impression of being a place that’s rich, exclusive, and reserved. In addition to the usual collection of condos and vacation resorts, it has a Hilton Hotel as well as two golf courses. Private properties line most of the shoreline on the west side island, meaning people passing through Longboat Key will only get a direct view of the Gulf waters for a few short stretches. 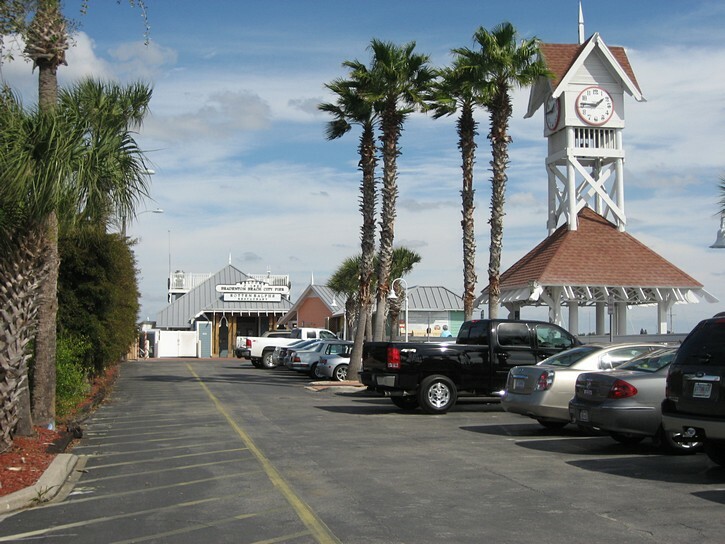 Public access points to beaches on the Gulf are limited and not all that evident. 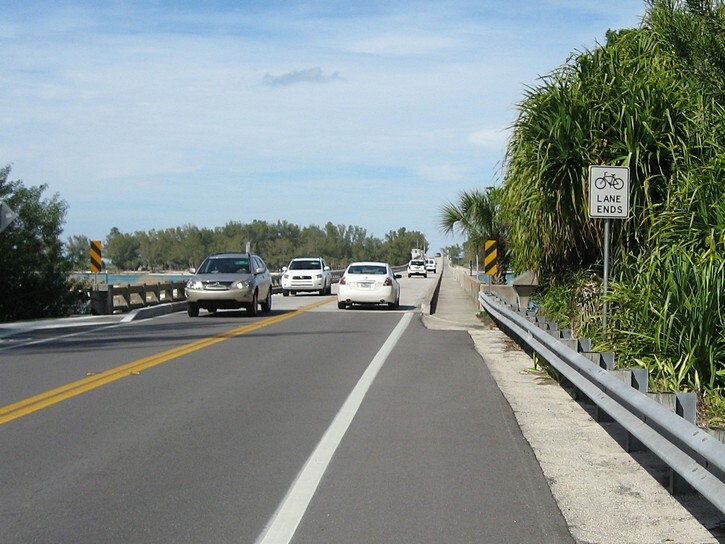 Although Longboat Key may only have limited appeal for someone who is just passing through, it does have one feature that will be of interest many to cyclists: it’s possible to ride across the island with very few interruptions. Aside from one or two slightly busier intersections (one with traffic signals), it should be possible to cut through the rest of the island without having to make one stop. It’s a great place for training rides. Compared to neighbouring islands, Longboat Key doesn’t have that many places where you buy can a snack or stop for a meal, especially along Gulf of Mexico Drive. Some of the restaurants seems a little posh for cyclists looking for a quick bite to eat, but you try Harry’s convenience store, and directly behind it, Harry’s restaurant (which has a patio). 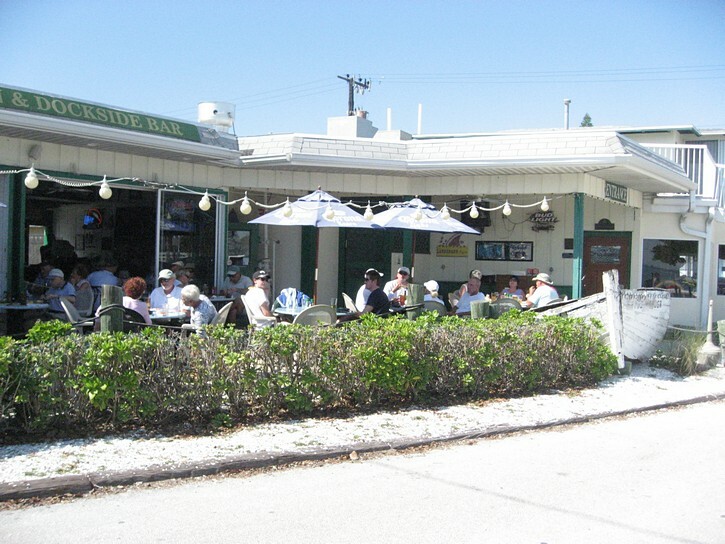 They are located about two-thirds of the way through Longboat Key, at the corner of St. Judes Drive (but you’ll have a larger selection of such establishments on Anna Maria Island). 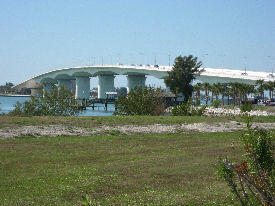 At the northern end of Longboat Key is the bridge to Anna Maria Island. Unfortunately, it’s an older bridge that does not have a shoulder or bike lane. This shouldn’t pose too much of a problem since it’s only a few hundred yards long, and the bike lane resumes as soon as you get off the bridge. If Longboat Key gives the appearance of being affluent and exclusive, Anna Maria Island seems to be more proletariat by comparison (if such a thing can be said about this part of Florida). 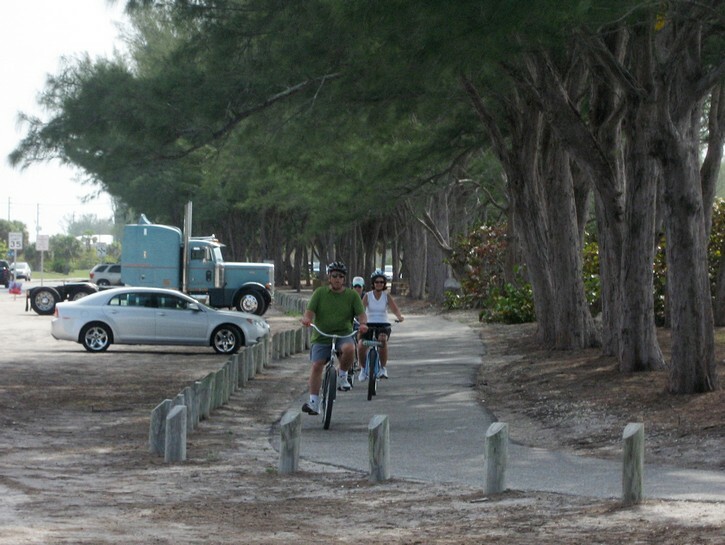 The first thing you’ll notice when you cycle onto the island are the large parking lots and a long segment of parkland which provides people ready access to the beaches on the Gulf of Mexico. Further north you find a residential district that actually look a bit like an ordinary suburb, complete with the ubiquitous strip malls. 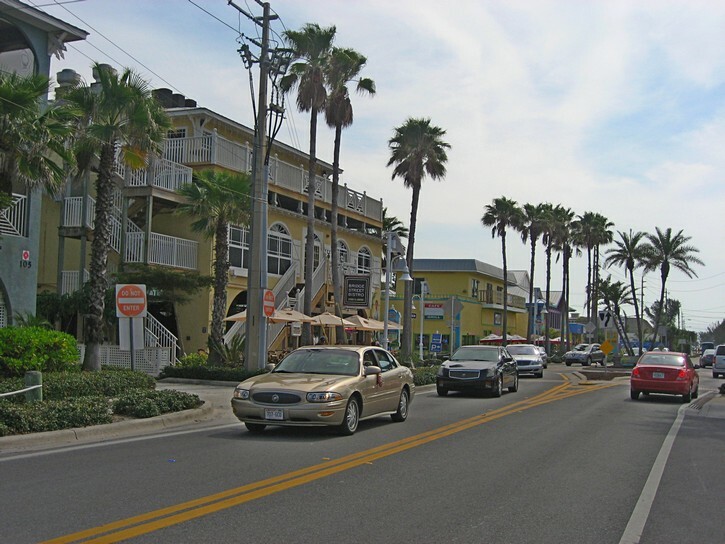 It’s not that Anna Maria Island is not a popular tourist spot, it’s just that ritzy condos and resorts don’t seem to dominate the place as much as in some other parts of Florida. Interesting sign in Anna Maria Island. Another noteworthy characteristic of the island is that unbridled tourism development has been restrained for the pass couple of decades. 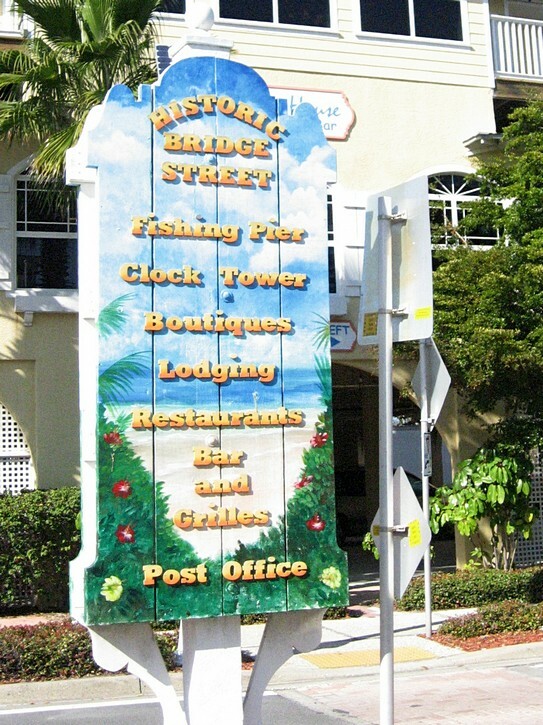 Instead of being greeted by rows of modern high-rise condo and hotel complexes, visitors will discover that the tallest buildings are no higher than three stories high, and that many of the old motels, restaurants, and shops that were built in the 1950s and 1960s are still standing and in use. 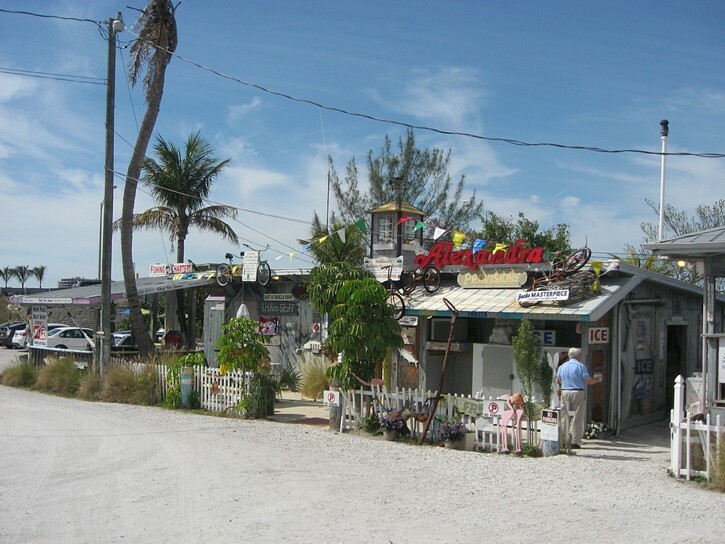 Because of this, Anna Maria Island is known for having an ‘Old Florida’ feel about it. 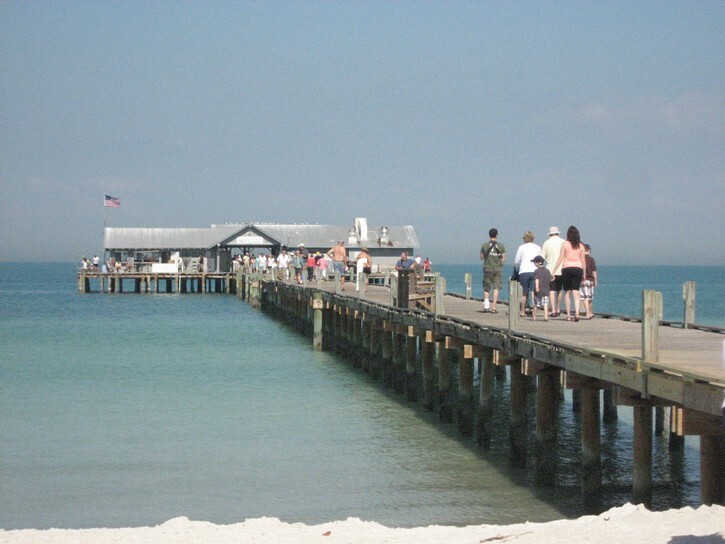 Anna Maria Island is a little under 8 miles (13 km) long, and it is the northern most of the barrier islands before the wide open waters of Tampa Bay. For the most part you’ll be cycling along the island’s main road, Gulf Drive which, except for a few intermittent spots, has a good paved shoulder. Further to the north the name changes to Manatee Avenue, Marina Drive, Palm Drive, and then back to Gulf Drive, but it is easy to follow. 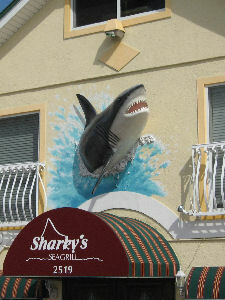 Moreover, you should have no problems finding convenience stores or restaurants at various spots throughout the island. 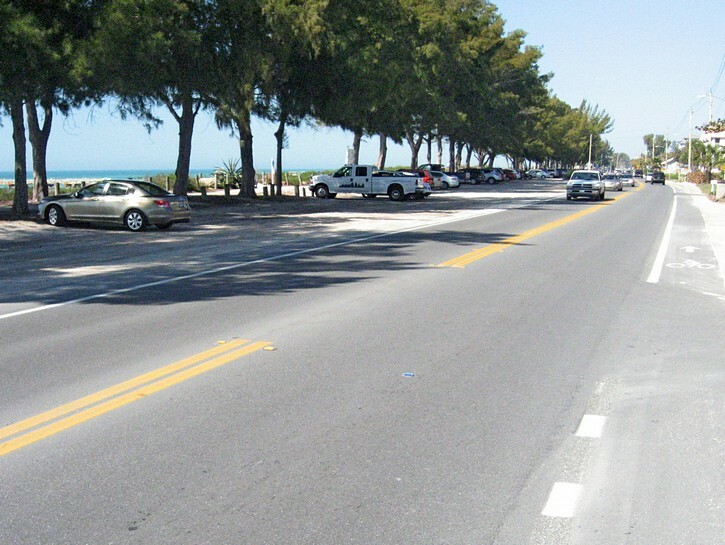 Initially, the road runs next to the shoreline and you’ll have a good view of the Gulf of Mexico. At one point the bike lane seems to come to an end and there’s a sign directing cyclists to follow a scenic route east of the main road. This is only a small detour that will take you along Bay Drive and “historic” Bridge Street. There is a good assortment of restaurants and boutiques in the area, and although it’s not very long, Bridge Street is particularly interesting. At the end of the street is the remnants of the old wooden bridge to the mainland that was first built in the 1920s, and which now serves as a pier. As you continue north, the main road will eventually veer away from the shoreline and head into the middle of the island. This is where the island is wider and more built up. As the road works it way through this area, it makes a number of 90 degree turns (which are easy to follow), but you’ll have to be prepared to make stops at traffic signals at some of the busier intersections. 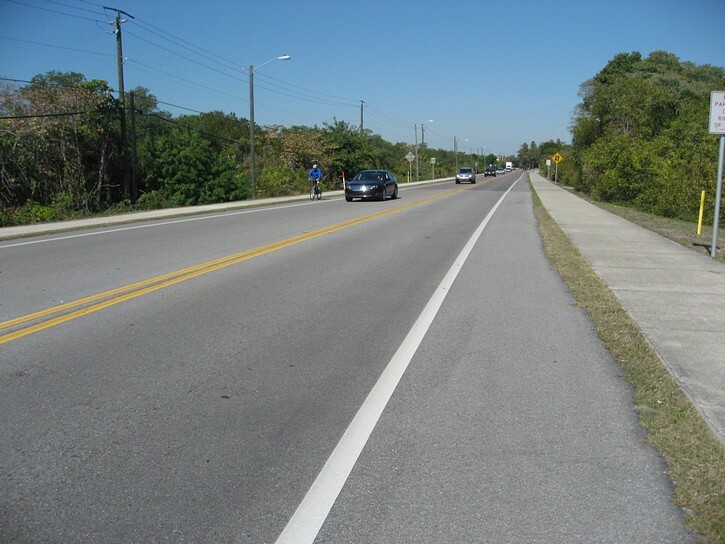 If you don’t want to cycle all the way to the northern tip of the island, you could turn around where the main road meets Manatee Avenue (right after passing a small strip mall on your left). 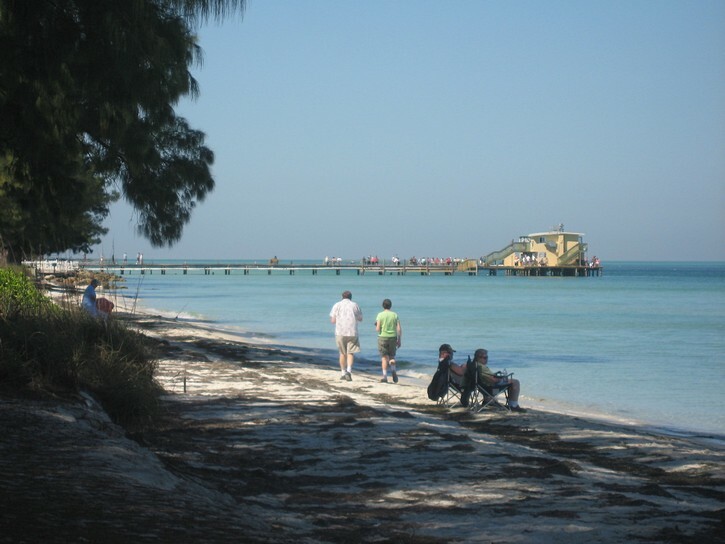 By this point, you will have gotten a good taste of what Anna Maria Island has to offer. 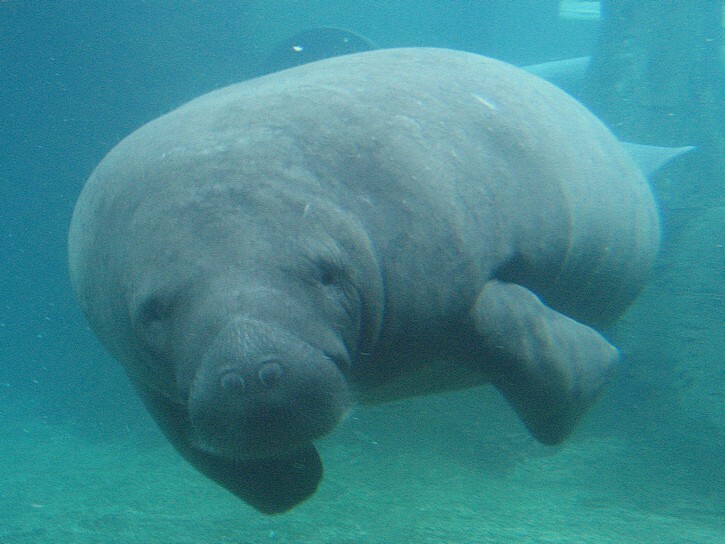 For those of you who want to push on, you’ll turn left on Manatee Avenue to stay on main road. In about a mile, right after the road makes one of those 90 degree turns, you will see on the left a tourist information office which is operated by the local chamber of commerce. You may want to stop here and pick up a free map of the area. You can use it do a little exploring and plan an alternate route through the northern part of the island when heading back. As you get closer to the northern tip of the island, Gulf Drive makes a 90 degree turn to the right and becomes Pine Avenue. The area around Pine Avenue is strictly low rise and low density, but it does have a number of boutiques, restaurants, and small stores. At the end of Pine Avenue is a fairly long pier that jets out into what is the beginnings of the Tampa Bay. This could be a good place to stop for a rest and take a stroll on the pier. On a clear day you’ll be able to see St. Petersburg in the distance. From here you can cycle about half a mile before you reach the very end of the island and have to begin your ride back. If you picked up a map, you should be able to plan an alternate route on some quiet roads in the northern part of the island. However, you will have to retrace your route when heading back on the main road in the southern part of Anna Maria Island, Longboat Key, and Lido Key. Map of ride from Siesta Key to Anna Maria Island. Click here for a larger map.